Large viewable screen, with real-language text. Status LEDs for immediate feedback. Start, stop, reset, local/remote push buttons. Unique wiring loom separates wires for easy install and allows access from top, left or bottom. Top and bottom cable retainers for tidier wiring. Small footprint and depth saves space. 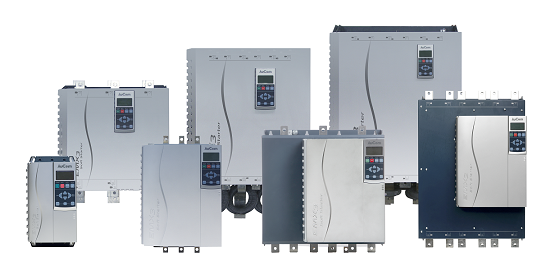 PowerThrough - enables the choice of continuous operation despite a power assembly failure. This allows production to continue while long-term remedial action can be taken. The EMX3 supports network communication using Profibus, Profinet, DeviceNet, Ethernet/IP, Modbus RTU or Modbus TCP protocols, via easy-to-install communication interfaces. Enhance personnel safety by preventing accidental contact with live terminals. The finger guard kit fits EMX3-0220B to EMX3-1000B and provides IP20 protection when used with cables 22 mm or greater. Using AuCom's custom designed WinMaster software you can control, monitor and program your EMX3 from your desktop computer.